Many working men and women are at risk. We’ve seen it all before, uncertain jobs, reduced compensation, saving less, underwater real estate ownership, renting not owning, little or no medical care, pensions insufficient or non-existent, wanting for food, desperate short term loans, little insurance for the young, a government safety net torn to shreds, and what little we have to leave behind for our family when we die. Our ship of state is taking us into the roiling waters of insecurity, financial and human, into a field of economic violence, and, ironically enough, it’s the hardworking man or woman who shows up every day, no matter what, to work a job, who will suffer. 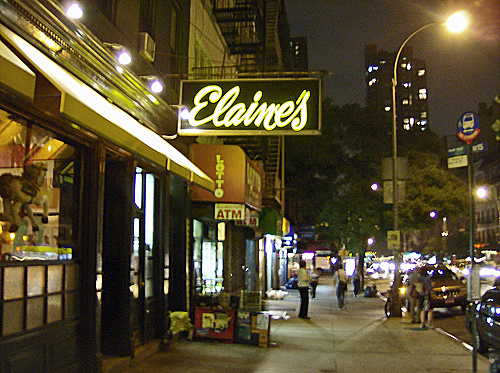 In New York, there was a special place on the Upper East Side called Elaine’s – after Elaine Kaufman. If Elaine liked you, you got a good table. Writers, artists, film-makers and stars came there. Not like Studio 54. No. They came to eat, to talk, to see and, yes, be seen. No dancing. No drugs either. Woody Allen would always sit in the back, and sometimes he’d play a tune on the piano. It was a cramped and cozy getaway that didn’t awake until most everyone else had gone to sleep. Elaine would seat the “special” guests up toward the front opposite the bar on the other wall. The glitterati would sit up against the wall, one removed from the passerbyes heading for a table in the rear.